Going over this setup, I think its necessary to check “allow negative power” for the three mains while doing this experiment. If that was not checked, note when they are changed so that we can disregard data from before then if need be. 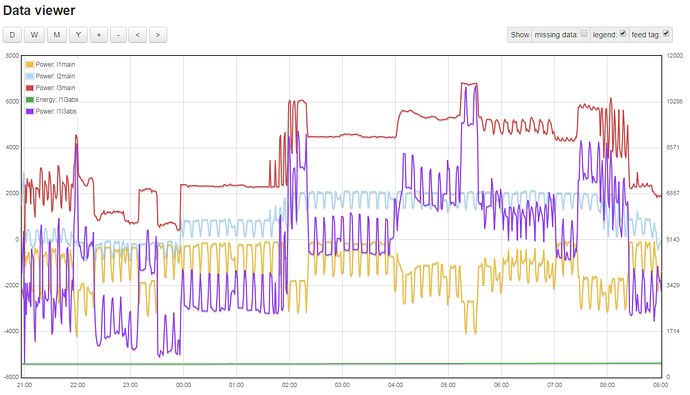 CI had my money on L1-L3 with the new settings, but now I’m looking at how accurate the L2-L3 is before the change. 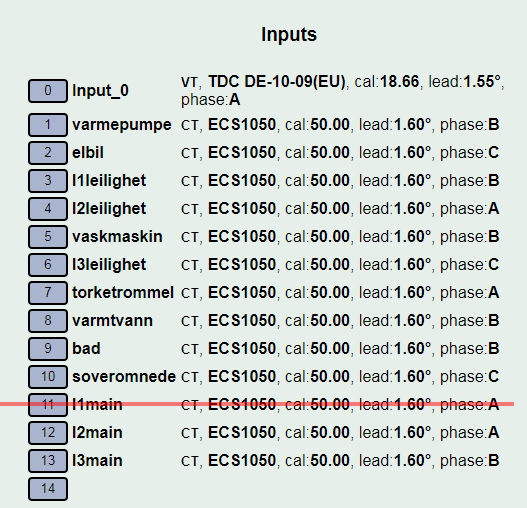 Just to be sure I have that right, before the change main2 was phase A, and main3 was phase B, is that correct? Being more of a programmer than electrical engineer, we may have to stumble on the solution here, but I would like to understand the ultimate solution, and be able to produce a methodology for others to do this. I’m assuming that you are getting the most recent data directly from the IoTaWatt, rather than using the influx integral function. I have had anecdotal reports of that not working quite right with negative numbers, and I believe that this measurement method can produce them. There will be a solution to that potential problem once the proper setup is identified. In the meantime, I’m still scratching my head. Can you verify that the VT is connected between L1 and L2? UPDATE; @Giraffe, are you following this? I’d be interested in your input. VT is connected to L1-L2. Data compared with my meter is based on summed values from kwh output from iotawatt to influxdb. Very much appreciated help so far. 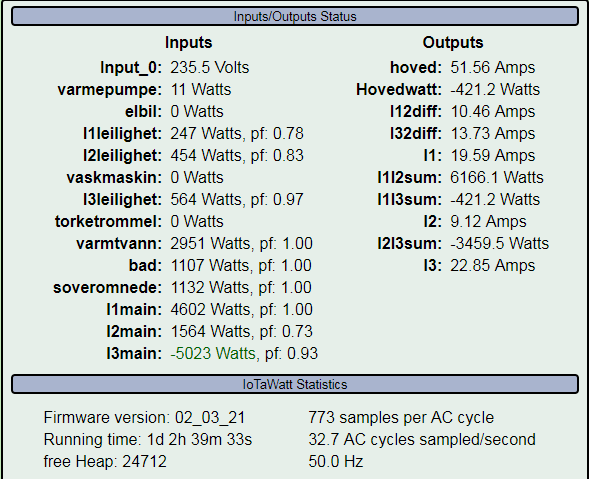 I could most likely live with the previous setup, as all my individual circuits seems to be working fine (1kw - electric heating = 1 kw on the iotawatt, 3kw on the warmwater = 3kw on the iotawatt, etc), but would be happy to conduct more tests / configurations if this would be interesting. 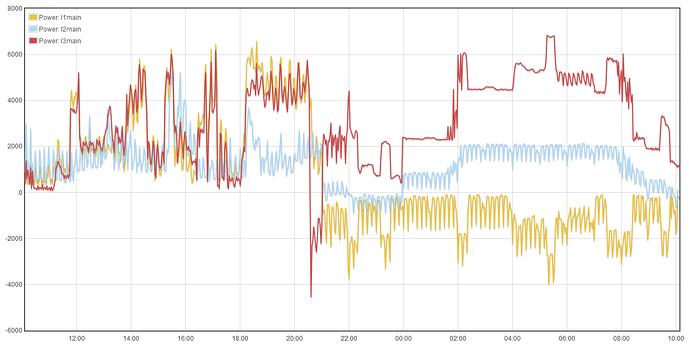 L3 shows positive watts, L1 and L2 negative. Sum of watts on above 3 combinations is always 0. Might be a longshot, but found it as an interesting observation. 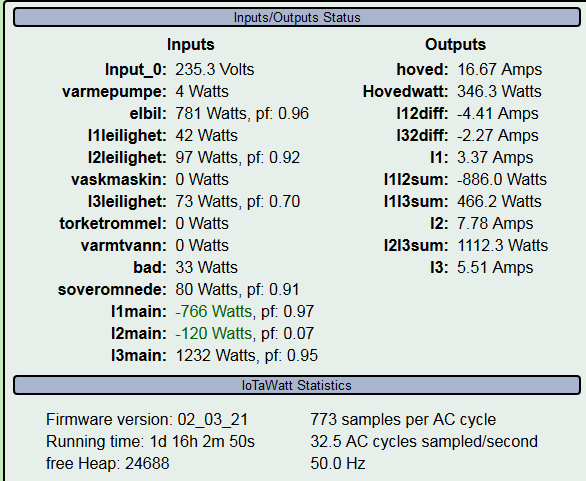 I could most likely live with the previous setup, as all my individual circuits seems to be working fine (1kw - electric heating = 1 kw on the iotawatt, 3kw on the warmwater = 3kw on the iotawatt, etc), but would be happy to conduct more tests / configurations if this would be interesting. Then take a look at the sum of those values over the 21:00 - 09:00 period. I think it will be 64. Something is off there, the result still goes negative. Could you show the output definition in the setup output display? Thanks, I see the right axis now. I now realize that this can’t be done retrospectively. The algebraic sum of each main is converted to absolute value, which is not the same as converting each individual measurement to absolute value. So this doesn’t work. Sorry. it would have to be done by removing the allow negative values and running for awhile. If you could double check that this is how you have it and it works, that would be great. I wanted to lay it out for the next person that needs to do a three-wire system. Please get back and confirm the accuracy of the results. 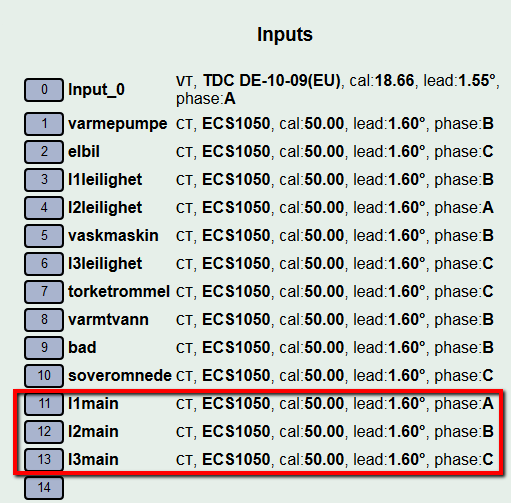 If you choose the first mains option above, main1, phase A and main3, phase C, with the extra input from removing main2 you could connect CTs to L1-A and L3-C on that branch meter and the sum should match that meter. Excellent ! I will "re"configure my iotawatt and revert with results tomorrow. Again thx for all the support! 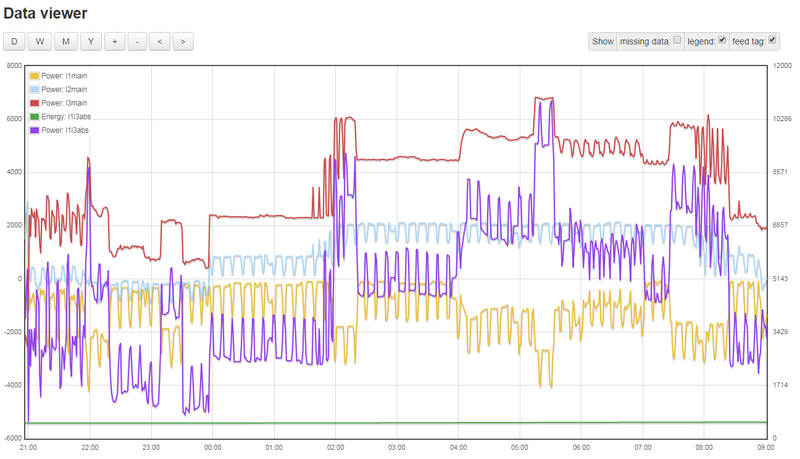 So after ~10 hours it looks like we are spot on kwh usage between iotawatt and my meter ! From 23:00 - 9:00 I have used 38kwh both on the iotawatt and the utility meter. 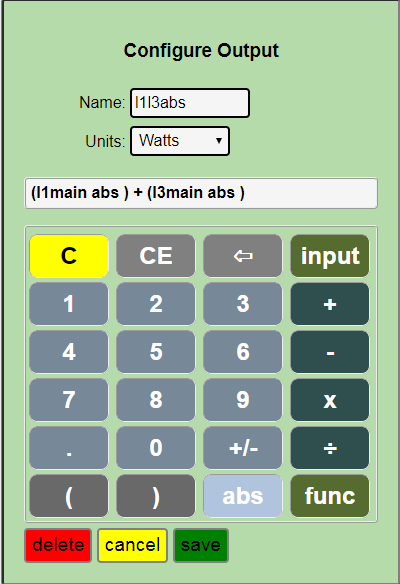 I used the following setting where I am using sum of kwh from L2-L3. Just following up to be sure this is working correctly. 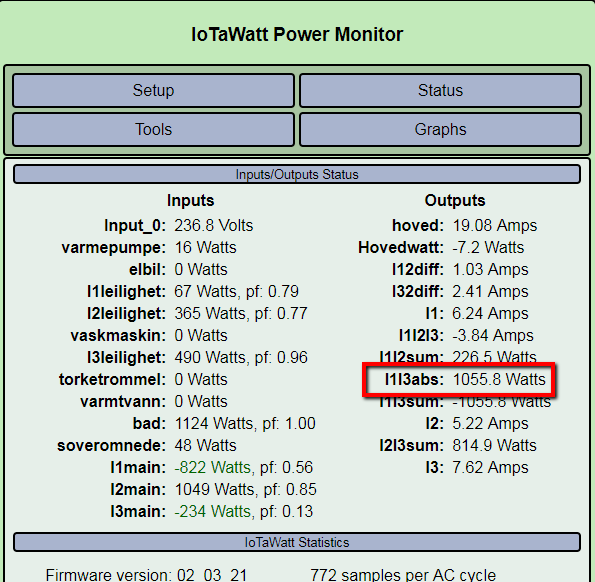 Does your energy meter agree with the IoTaWatt now? Spot on ! Everything works perfectly !